BETHLEHEM (Ma’an) — Earlier this week, Al-Haq, local rights organization, along with other Palestinian, regional and international organizations, sent letters to the diplomatic community in the occupied Palestinian territory (OPT), the UN Secretary-General and High Commissioner for Human Rights, calling on them to take action ahead of the one year anniversary of “The Great Return March,” to ensure that Palestinians’ rights to life and to freedom of peaceful assembly are protected. 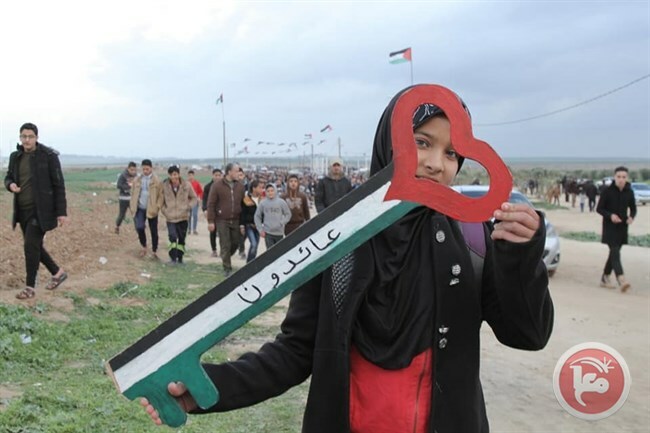 According to statistics issued by the Palestinian Ministry of Health in Gaza, since March 30th 2018, Israeli forces have systematically and deliberately resorted to lethal and other excessive force to suppress “The Great March of Return” in the besieged Gaza Strip, killing at least 266 Palestinians, including 50 minors, six women, and one elderly, as well as injuring 30,398 during the mass protests. In May 2018, Al-Haq and human rights organizations sent an open letter to the United Nations ahead of the 70th anniversary of the Palestinian Nakba, as part of “The Great March of Return.”However, the UN failed to take action to prevent the killings and massive suppression of peaceful Palestinian protesters along Gaza’s borders. As large-scale civilian protests are expected to take place on and around March 30th, Al-Haq urged “the international community to take meaningful action to prevent further unnecessary loss of life and injury by the Israeli occupying forces, which entails individual criminal responsibility, as found by the UN Commission of Inquiry on the 2018 OPT Protests.